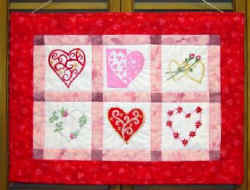 This is Betty Tigue's beautiful wall hanging done with the Hearts Desire collection. 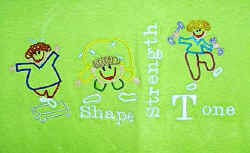 Look at this cute exercise tote embellished by Donna with the Stik Exercise Ladies trio from the Mix 'n Match Miscellaneous section. 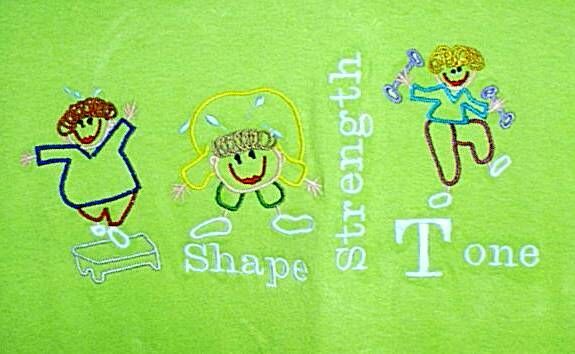 Sharon C. came up with this creative way to use the Stik Exercise Ladies on her t-shirt. Cute! Betty Tigue made this pretty wall hanging using the Birdhouse of the Month Appliqué designs. Love the colors! Genia T. had me digitize her brother's big rig for the back of his denim jacket. She says, "It stitched out better than most all of the designs I've purchased from the 'Big Name Brand' companies! ". 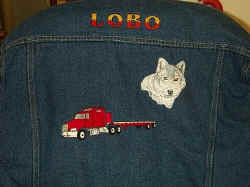 You will find this truck on the Mix 'n Match Transportation page. 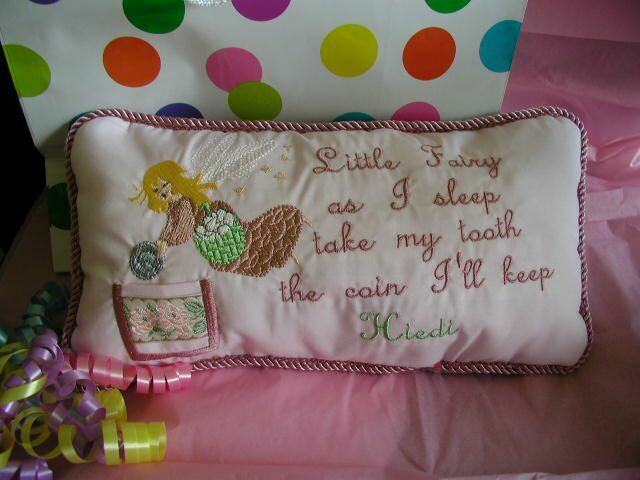 It's so neat to see all the different tooth fairy pillows that people are making with the designs from the Tooth Fairy Pillow project page. 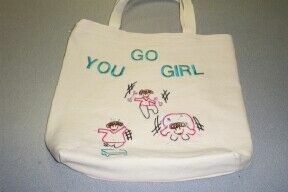 Here's one Mikki C. made. I love it, Mikki!
" 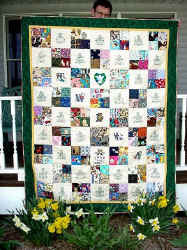 I wanted to tell you about the quilt I made for my friend Twila using your designs. I was asked to do a program for our mother/daughter dinner at church about my quilts. Giving Twila her quilt was to be the last thing on program. She had accompanied me to help hold up the quilts and to arrange them on the floor for later viewing. I must have run the scenario in my head a hundred times about what it would be like when we got to the part where Twila got her quilt. We'd hold it up and she would look at it and see that the cat cross stitch blocks spelled 'Twila' and she would realize it was for her. Well, it didn't happen quite that way. 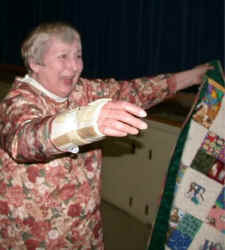 I told the audience I had one more quilt to show them and Twila and I held it up. I started talking about it a little to give her time to notice, but nothing happened. Then I realized she didn't have on her glasses and she is blind as a bat when it comes to reading anything, even as large as those letters, and the audience realized it was for her before she did. They started clapping and I had to spell T_W_I_L_A pointing out the letters before she got it! It was fun and funny. She said she just loves the little girls from all the countries. 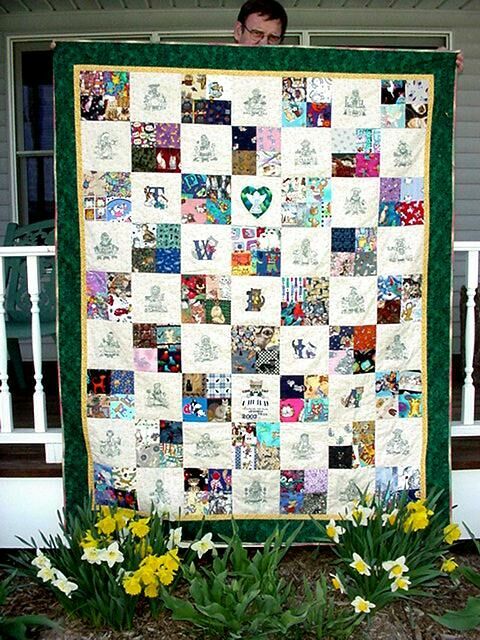 I sewed them all in green for her and made the whole quilt as green as possible since it her favorite color. I have done them all in red for a quilt to be made at a later time." 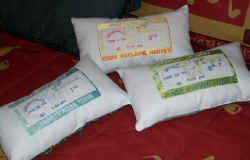 Louise T. makes these pillows using the Special Delivery birth announcement design from the Mix 'n Match Children's section. She does each one in the colors to coordinate with the nursery. Isn't that a great idea?